The MaMa Lotion gel is the ultimate lotion for those wanting to diminish fine lines and wrinkles, lighten their complexion, fade acne scars, fight acne, or even out skin tone. Highly concentrated with 20% AHA formulation containing 10% mandelic acid and 10% malic acid, the MaMa Lotion is a remarkable alpha hydroxy acid serum that is perfect for anyone who wants to improve the clarity, texture and overall appearance of their skin. As you use MaMa Lotion, your skin will become noticeably smoother and brighter, and the appearance of uneven pigmentation and sun damage (rough skin, sun spots, enlarged pores) will dramatically improve possibly eliminating the need for foundation or cover up. Over time, MaMa Lotion also helps rebuild collagen levels, firming the skin and reducing the appearance of fine lines and wrinkles. MaMa Lotion can also easily incorporated into your current anti-aging routine in order to speed results. Mama Lotion removes dry, dead skin cells from the surface of your skin that can interfere with the penetration of additional skin treatments. Incorporation of MaMa Lotion into your current reoutine will result in deeper delivery and increased effectiveness of your existing skin care regimen. MaMa Lotion is particularly effective at reducing pigmentation problems in the skin. 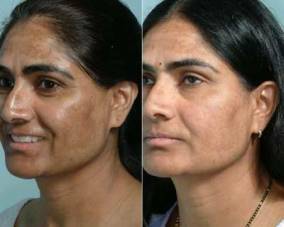 Acne, sun exposure, melasma (pregnancy mask) and many other skin conditions can result in brown and ed marks on your skin. The combination of two gentle AHAd and potent anti-inflammatory marine extracts makes MaMa Lotion effective at reducing existing hyperpigmentation while preventing new hyperpigmentation. Click Here For More Before & After Pictures.